can enable your Top Management team, contact WSA today. By improving leadership skills and applying them to specific organizational change challenges, WSA has been able to achieve an exceptionally high rate of success in assisting organizations to achieve successful implementation of improvement in organizational competence and performance. Leadership development is essential for most major change initiative work. 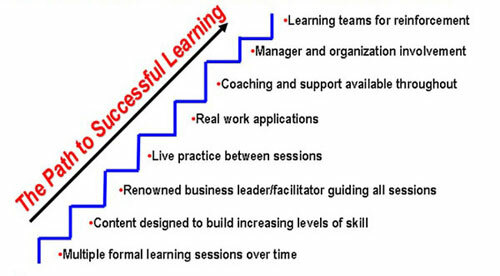 Specific, targeted organizational change challenges create the learning lab for application of the skills being taught. An organizational change challenge needed as lab work for application of the skills taught in the leadership development program. The end effect is accelerated learning and accelerated change. The energy, focus and leadership of your top management are critical success factors for successful organizational change. A well developed leadership development program acts as a catalytic force to drive the success of any leadership team wishing to achieve substantial improvements in organizational performance. WSA has been offering this unique approach to Leadership Development for more than twenty-five years with thousands of managers and leaders across the globe. Validated in use by small and large companies alike, the program enhances the skills of active leaders and managers while developing organizational competence through the real-time problem-solving exercises built into the program design. The program typically includes seven formal one-day modules offered over seven months, along with a wide variety of supporting informal learning activities and on-the-job applications between the instructional modules. While the overall content is based on a validated development model, both content and application are customized to meet the unique needs of your organization. Companies sponsor this program when they have a cadre of leaders that they wish to develop, and would also like their development to be immediately applied in the work environment, addressing organizational needs. This model is particularly effective during times of organizational growth, organizational change, or in response to significant shifts in the external market or business environment. WSA has developed the program and implemented it successfully with executives at all levels throughout North and South America, Europe and the Middle East. The business and economic climate is more challenging today than ever before and not likely to get any easier. Competition is global — even if your business is local. Competitive products come from anywhere. It is increasingly difficult to create a high performing organization. Knowledge workers require a different way of being managed, and respond to a different type of leadership. Customer loyalty can no longer be taken for granted. It has to be re-earned every day. Financial pressures require that organizations do more with less every year. Leadership and management skills are among the most critical resources for facing these challenges. That’s why leadership development is so essential, especially in turbulent times. Leadership is perhaps the only truly sustainable competitive advantage. This program has been designed for individuals who have significant management or leadership responsibilities. This may include functional (departmental) management responsibilities, cross-functional team responsibilities or other similar leadership roles. For smaller organizations, the program is best suited to Presidents, Vice Presidents and Directors. Develop the leadership and management skills of participating individuals. Availability of one-on-one personal mentoring or coaching for any participants in need of extra support. Develop leadership and management skills to complement the technical competence of your organization. Increase the leadership bench strength your organization will need to continue its success in the future. Solve some of your company’s persistent problems as program participants apply the program elements to real-time company situations under the guidance of the group consultant. Develop strong learning teams (functional or cross-functional team building) for companies that choose to send a learning team. Give your next generation of leaders the skills they need to help prepare your company for the challenges that lie ahead. This program contains a number of elements designed to provide fully integrated, self-reinforcing learning experiences. The following is a brief description the core program elements included in this total learning experience. The integrating vehicle for the program are the seven one-day facilitated sessions delivered in an action learning (workshop) style. These sessions are typically held one month apart, and are all conducted personally by Seasoned WSA consultants. The sessions evolve in complexity as the leadership model is developed through the program. A detailed description of the program content is provided in subsequent sections of this brochure. To ensure that learning is highly interactive, a maximum of 30 participants may be enrolled in a program. In addition to the highly developed program content, each group applies the content through real-time organizational issues and problems. These organizational challenges or opportunities are pre-selected by senior leadership. Examples have included performance management systems, continuous improvement systems, development of organizational culture, customer feedback and satisfaction systems, implementation of major change initiatives, implementation of enterprise-wide software systems, etc. Participants receive a manual with extensive materials for each of the program modules. These materials have been developed and copyrighted by Work Systems Associates. They have been validated and continuously refined over a twenty-five year period, applied with more than five hundred corporations throughout North America and Europe, and used directly by more than 20,000 managers and leaders. In addition to the information required for the workshops, other related materials are included as well for reference. The participants receive a valuable set of resource materials that can be used in many aspects of their work. To help ensure application of the concepts and skills developed in the program, learning teams are formed to reinforce personal action plans and on-the-job applications. 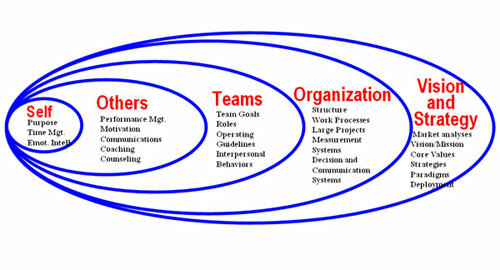 Learning teams may represent existing segments of the organization, or they may be designed as cross-functional teams. Sometimes they are selected to address a particular organizational challenge, or address common customer issues. If learning teams are not pre-set, then the group will be divided into different teams each module, to further reinforce the cross-functional learning opportunities presented through the program design. WSA Canada also maintains personal availability to the participants between sessions. Individuals may call for personal discussion or coaching, or share materials for feedback via fax or email. Before, during and after the program feedback sessions are offered to the managers of the participants and to the senior executives of the sponsoring organization. These sessions include ways to enhance the learning and application of each of the participants, and also provide feedback regarding any organizational issues or opportunities that are identified in the program. Because this program is conducted over seven months with multiple experiences to tie the learning together the program can focus on real-time action learning and implementation issues. This is done in three ways. First, each participant maintains a personal Action Planner that serves as the glue between the sessions. This action planner is used to record both personal notes and plans at key points in every workshop session. Second, learning teams are created and used to identify and apply real-time work issues through collective action. Third, assignments are given to both individuals and learning teams for real-time work applications between the learning sessions. The class becomes a fully integrated real-work action laboratory in which ideas and activities are developed in the workshop, tried out on-the-job, and feedback is provided both between sessions and in the next formal workshop experience. 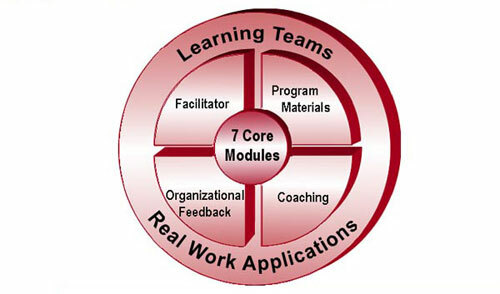 Following is a typical outline for the seven one-day modules. Sample module titles are provided. Organizations may select from these modules. Modules may also be customized. If new content is required, additional modules can be developed as well. Regardless of the specific content, the flow of the modules reflects the expanding circles of competence required by managers and leaders. The first segment – Modules 1-2 – focuses on personal and interpersonal leadership skills and styles. Recent research has validated the primal nature of emotional intelligence as fundamental to successful leadership. This section helps the participants examine their personal and interpersonal leadership styles and develop additional skills and tools for their leadership roles. The middle section – Modules 3, 4 and 5 – addresses concepts and skills related to performance management and team development. Performance management has been proven to be the single most highly leveraged system for increasing individual productivity and organizational performance. Content in these modules includes setting expectations, developing performance measures, providing feedback, coaching and counseling, and conducting reviews that enhance performance. The team development module builds universal team building competence, and may also be designed around specific real-time teams under development or in need of enhancement. The final section – Modules 6 and 7 – broadens into organizational design and strategic skills. Leadership skills in developing a vision, setting strategy and guiding large scale organizational change to achieve that vision are included in this higher level segment of the program. Other topics may also include project management, continuous improvement, or creating a customer-focused organizational culture. To begin discussions on how the WSA leadership development program can enable your Top Management team, Click Here to Contact WSA Today.